LEDGLE reg; - One World, One Light. The simple ceiling lamp is suitable for various decoration styles and rooms. It can give out soft light for a overlong time, which makes it worry-free to enjoy the stable using experience. And it is 100% safe to use. Choose LEDGLE, enjoy satisfying lighting. If you want to know more details or have any questions, please look through the detailed page or contact the customer service. -Our LEDGLE Lamp Comes with 1 Year Warranty Guaranteed. ✔Eye-protective LED Ceiling Lights- LEDGLE choose PMMA as the material of lampshade to ensure even light and reduce the glare. 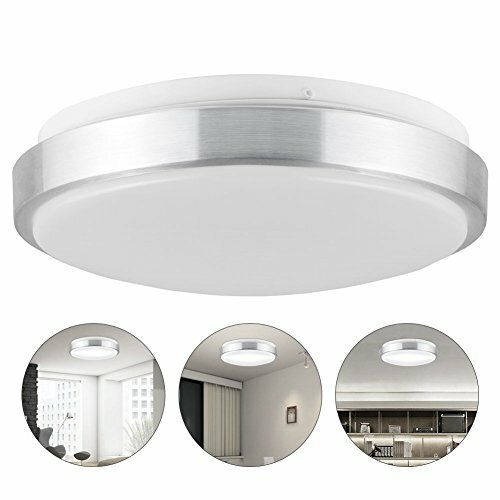 ✔Efficient Flush Mount Ceiling Light- The imported LED chip brings high brightness and low energy consumption. The lighting effect equals to 110W incandescent light bulb. Luminous flux: 960lm. ✔Simple Design- Elegant appearance and high-grade aluminum frame design show the modern style and classic quality perfectly. ✔Environment-friendly Design- Emit no UV light, infrared light and other radiation. The lamp body contains no harmful material, 100% safe to recycle. ✔Overlong Lifespan- High-end material offers great heat dissipation effect and longer working life which can reach up to 50,000 hours.